The eastward enlargement of the EU is accompanied by the accession of four new member states from Central and Eastern Europe, the Czech Republic, Hungary, Poland and Slovakia, as well as the inclusion of Bulgaria and Romania in 2007 and the integration of their defence industry infrastructures into the EU defence industry base. 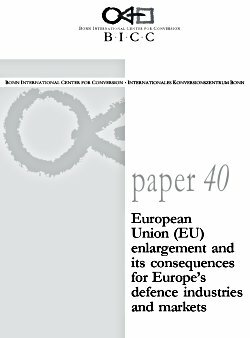 The accession of new member states and the integration of their defence industry infrastructures into the EU will inevitably have an impact on Europe’s defence industry base and the possible creation of a European defence market. However, the kind of impact that the new member states will have on Europe’s defence industry base and, in particular, on the creation of the European Armaments Agency (EAA) remains to be seen. The far-fetched idea of creating the EAA might become a reality in the not so distant future, some time after 2004. This issue is one to be discussed in BICC Paper 40.